I haven’t had my nap today (those are crucial to libertarian functioning, I hear), so a few reactions to the State of the Union. Let’s start with the three positives: 1.) 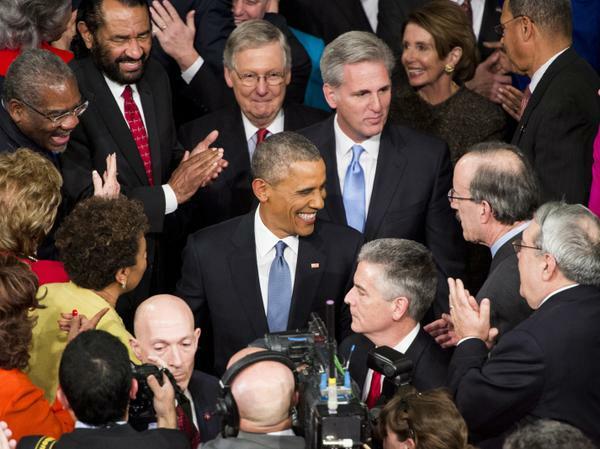 It’s great that transgender, bisexual and lesbian were mentioned for the first time in a SOTU speech. However, that deserves an asterisk: Never lose sight of the fact that it’s because the political capital is there to do so. It’d have been much neater to hear those words when the political capital wasn’t there. That’s courage. I digress, as this is the positive section…2.) Lifting the Cuban embargo. A failed policy for five decades with absolutely no sensible justification for maintaining. 3.) Obama’s always been a good orator with some swagger. If he wasn’t a president that killed innocent brown people, I’d probably want to drink a beer with him. Obama said, “We need to set our sights higher than making sure the government doesn’t screw things up,” and then said something like how we need to go further than “do no harm.” I don’t know, man, do no harm seems a good place to start. Let’s see how that works for a bit. I’m sure the men, women and children in Yemen, Pakistan, Somalia, Afghanistan, Syria, Iraq, Libya and so on, as well as those languishing in our prisons or otherwise burned by the War on Drugs would sure appreciate that. To add to the nonsense, he asked for Congress to authorize engagement with ISIS. Uh, we’ve been engaging — that means bombing — ISIS for months in Iraq and Syria with soldiers deployed to Iraq. So, what does this mean? 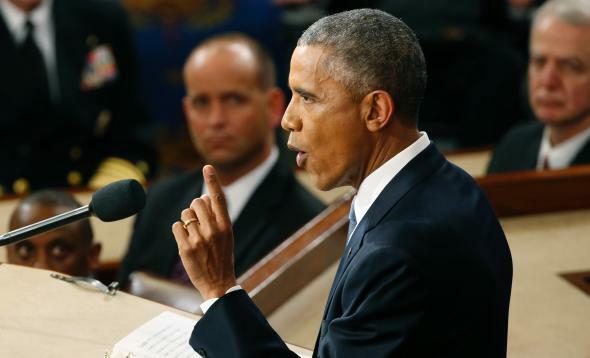 Moreover, Obama is far from the reluctant warrior he likes to portray. He’s not as hawkish as, say, Clinton or the brutish Republicans, but that’s a small scale. It’s 2015. That means another year where Obama affirms his commitment to close Gitmo. Moving on. He speaks well to ending the practice of torture and respecting human dignity. Yet, not only did torture still occur under him, but he didn’t want to prosecute those that engaged in it. Sets a great precedent — as in, it will happen again. As for the more domestic policy related issues, he sounds like a person running for student president in middle school, promising free snacks and gifts for everyone that votes for him. And you know, he has a magic wand that can just make everything happen. Government can do anything. Plus, you know, the two central themes seem to be “everyone plays by the same rules” and more or less, we want lobbyists out of the picture. Yet, the government never plays by the same rules (they can leak classified information when it benefits them, the police are unaccountable, as two examples) and crony capitalism is peppered throughout the speech, if you read between the lines. As a more direct example, those who gained to benefit most from Obamacare, wrote the damn law (insurers). All in all, it’s our routine dog and pony show. America is awesome. We’re always awesome. And we’ll keep being awesome as long as we keep dropping bombs and trying to manage the economy. Let’s work together guys! Professional wrestling is the best analogy to politics. Guys pretending they hate each other in the ring, but it’s all a work. Backstage, they’re friends. Or maybe friends is stretching it — at the very least, they benefit and profit from pretending it’s a shoot. The best thing is that he signs autographs on the way out – in case you had any kind of doubt it was a dog and pony show. I had my daughter watch a few minutes because I hope that when she grows up (she’s 5) that the SOTU will have more impact in future years than it does now, but I’m not going to hold my breath. Reblogged this on A Crazy Random Jumble of Blog. I gave the SOTU a skip this year. (Well, I was at a mandatory work thing, so it wasn’t by choice. But my tolerance for political spin is at an all-time low, so I’m not complaining.) Great comparison and great writeup. I love your writing! Whats your major? ooh. I would have guessed journalism, but that’s even better. Any career in mind? Sorry about that! Well, I was a journalism major, which requires you to double major, so I tacked on philosophy (which all my philosophy courses had been my favorites in time in college so far), but then I spoke to my journalism teacher because I’d already been in school for longer than I wanted and the journalism requirements would take ages. Long story short, he told me that my experience working on the school newspaper (and hopefully an internship at some point) would matter more than what it says on the degree. haha, don’t worry about it, my name IS Tom on here. Ahh.. I see. That’s awesome. I think you’ll do well. I had no idea you had to double major for journalism. Is that just your school? It makes sense though. Are you still a part of the school paper? Honestly, I’m not sure how it goes for other schools… But yes, I still work on the newspaper, approaching three years. I’m the online editor and I also do a weekly column for Opinion.